As I stood there trying to feel the humanity in the old Syrian man’s eyes, a photographer approached the woman next to me, who was also reflecting on the art. She was a thin and beautiful woman with great big bracelets, wild cosmopolitan hair, an art-gallery dress. “Can I take a photo of you?” asked the photographer. The woman moved to the spot indicated. “Thank you,” said the photographer. At the end of the little installation was a table with the artist’s business cards, each of which was backed with a photo of refugees. I took one. 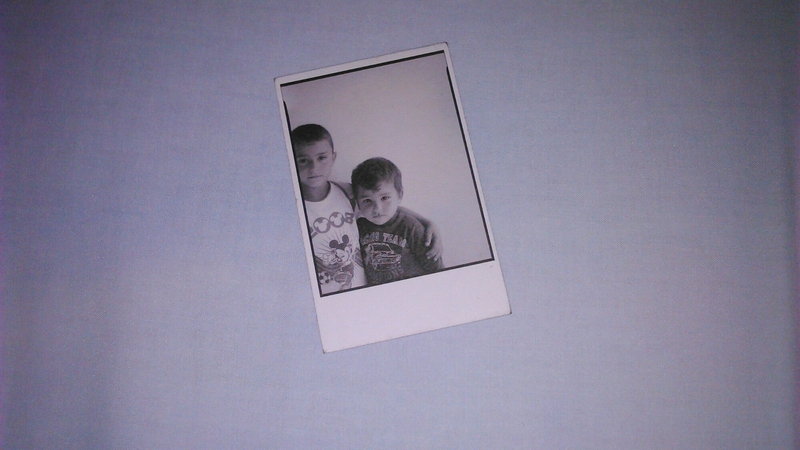 Now I have a picture of a stranger’s kids in my wallet. I identified Elise, finally, and she was standing in a circle with an older Italian couple (the woman, a Belgrade volunteer, the man, an attaché of the Argentinian Ambassador in Italy, or the Italian Ambassador to Argentina, I can’t remember), and another German woman from Hamburg. 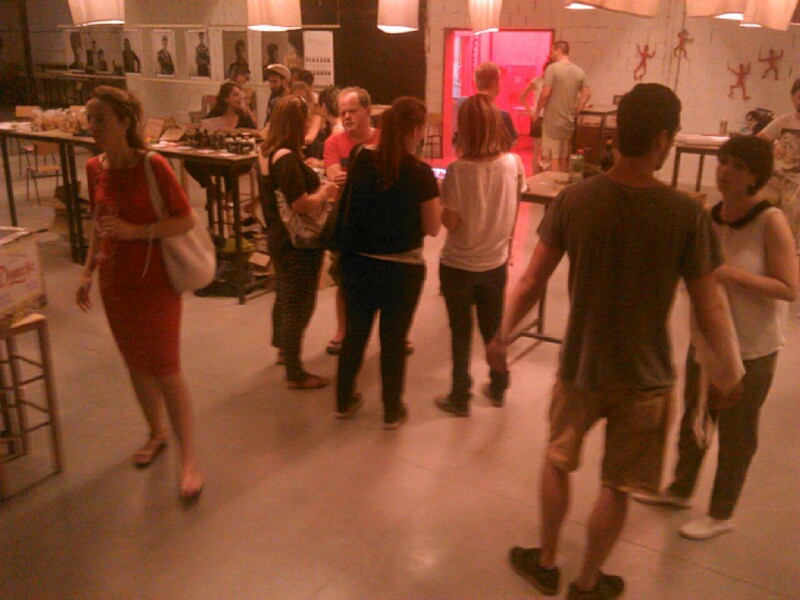 I awkwardly interrupted, and pretty soon they were giving me the history of refugee aid in Belgrade. 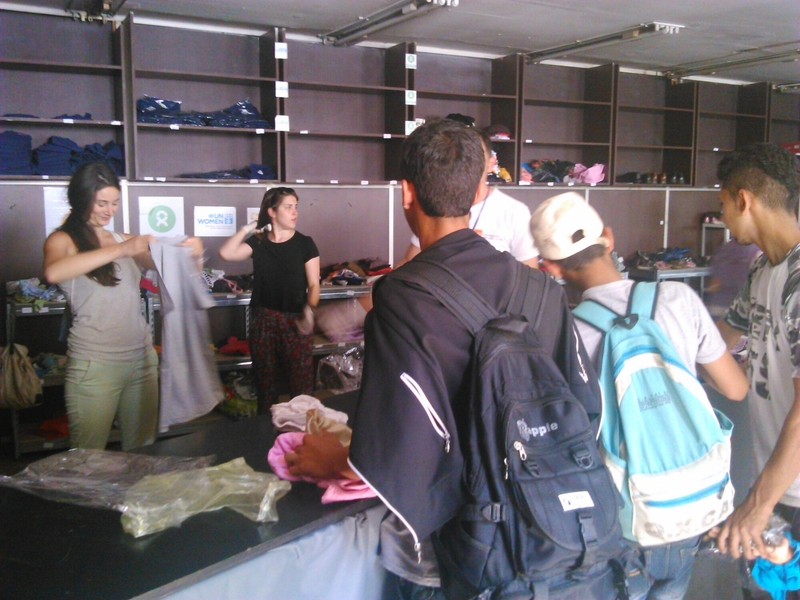 One thing I’ve found in every city I’ve visited: There are one or two or a half-dozen “main spots” where aid workers and refugees meet — sometimes initiated by the former, sometimes the latter — and this is where information circulates, food and clothing gets distributed, voyages encouraged or called off. Lots and lots of selfies are taken. In Belgrade, the main spots are the two parks in front of the bus station. According to Elise, when the parks filled up with tents and sleeping bags last summer, some local folks began slapping together non-profits to help the new-comers. 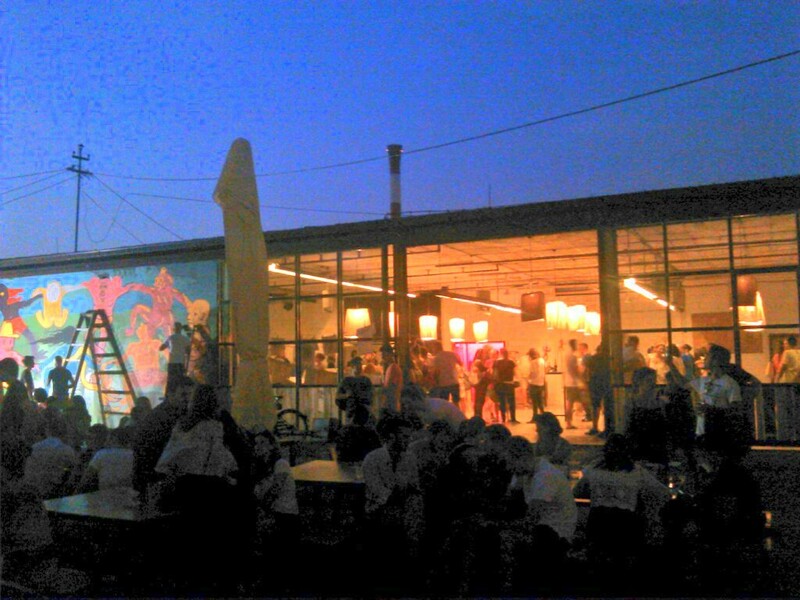 They turned an art space called Miksalište into a community/distribution center. The group Refugee Aid Serbia came out of that effort. Some other people bought a little wooden hut and set it up in the park and called it Info Park. I know this sounds like something you would read in a free magazine. But consider this. Miksalište, now managed by a 20-something Brit named Albert who came to Belgrade to teach English, served 1,000 meals the day I arrived in the city. Several hundred people from Afghanistan and Syria spend their entire day in these central parks, planning their routes, swapping info, and Info Park and Miksalište are at the center of all of it, handing out band-aids, serving tea, managing disputes between park security and refugees. 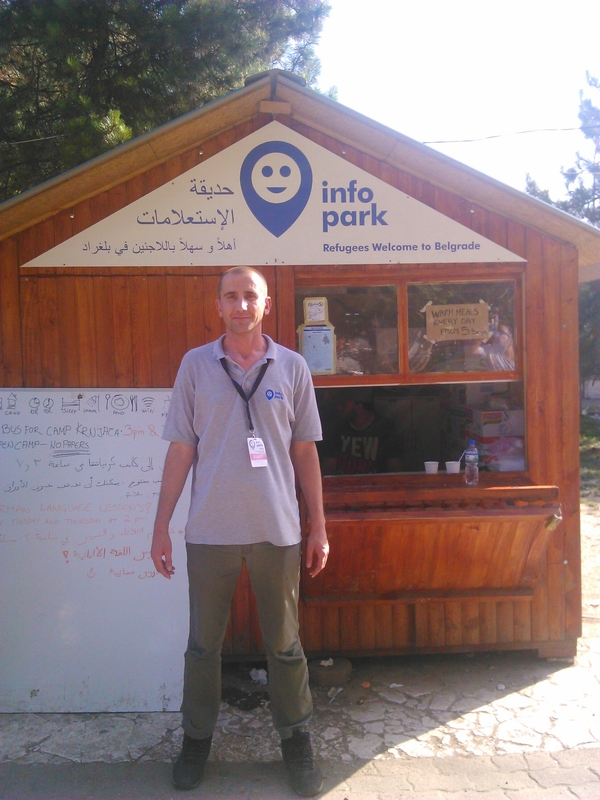 Today, when I arrived at the Serbia-Hungary border I swapped stories about Info Park and Miksalište with refugees. We had met the same volunteers, because there are only a dozen, maybe two dozen, who run the whole show. The event this night was called “Humanity in Motion: Volunteers’ Stories,” and there was going to be a round-table discussion. By 9 p.m. there were about a hundred people there, and I think about 17 knew this had something to do with refugees. The music had started, it was a hot day, and most people were about three beers in. All except for a small group of volunteers who were supposed to be sharing their insights, but were instead being lectured about the nature of refugeehood by a Berlin architect. So the round-table was ruined by patriarchy. When I jumped in on the conversation, this architect from a reputed lefty Berlin establishment called Holzmarkt was already deep into a pitch about… Well, I couldn’t really tell because it was encrypted in that capitalist language that only reveals its meaning when you commit money or sign a contract. “We need to find people brave enough to say, ‘I can’t help everyone’,” he said. Then he looked around at everyone, his captive audience, through his thick-frame glasses, with that I-just-surprised-myself look a doctor will give you when he explains how an infection works. He was talking about trying to find employment for refugees with a background in the arts, and someone asked the natural question: How would that jibe with their status as refugees? “But I’m talking about ‘refugee’ as a legal status,” the guy rephrased, a bit embarrassed. 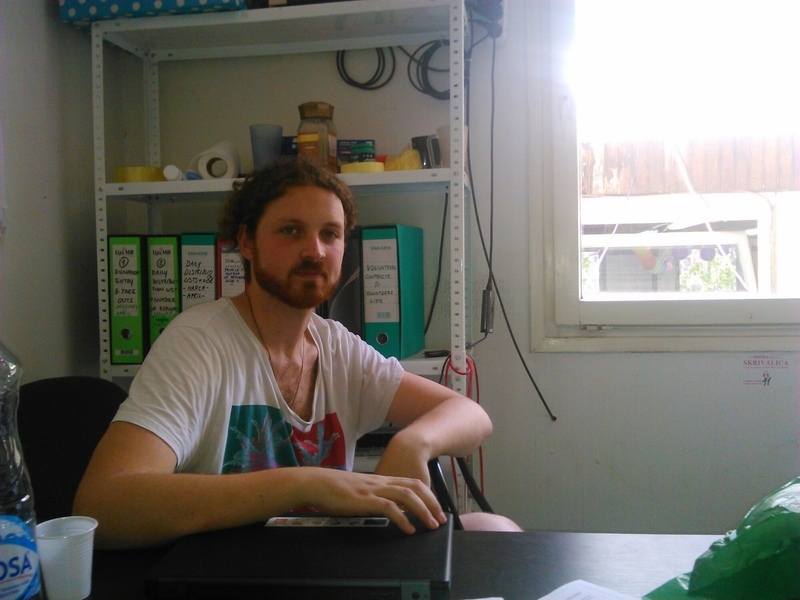 I can only imagine what the volunteers — most of them women who had spent the better part of a year turning Belgrade into a safe place for refugees — I can only guess what they felt as this guy went on and on about his ideas for solving the refugee crisis, one brave new start-up idea at a time. Es geht um Geld, as the Germans say. It’s about money. “Coats you can use as sleeping bags! It’s perfect!” was the last thing I heard him say.